As employees increasingly work from a variety of locations and companies lease co-working spaces – or even do away with offices altogether – real estate developers and owners seek the ever-elusive “edge” that will keep their companies and their buildings competitive. To do so, developers are expanding building amenities to entice top talent and facilitate staff engagement. 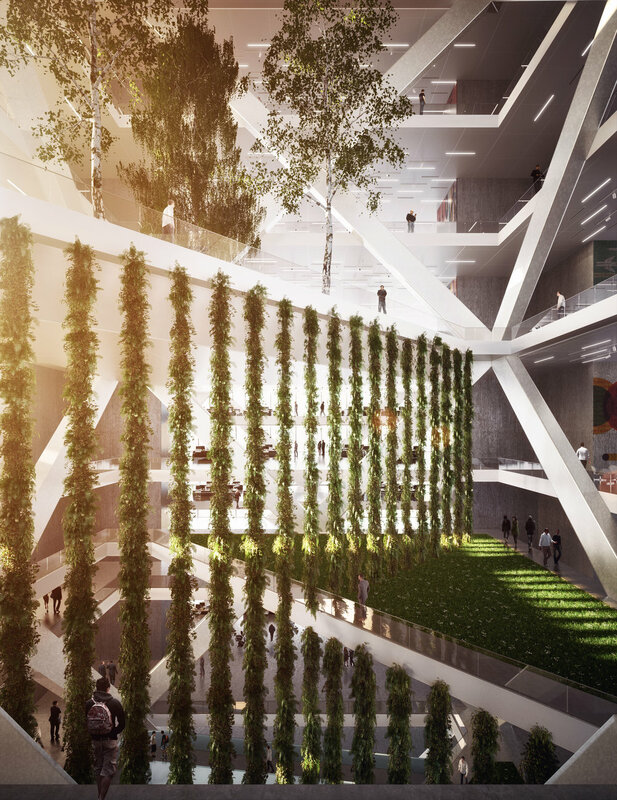 Assessing these trends and drawing upon research on intrinsic motivation, NBBJ wanted to test spatial ideas of how we could address the future of amenities in high-rise office buildings, in an urban concept called the Amen(c)ity Tower. Created to generate new ideas about the future of high-rises, this proposed design comprises an office tower that would be cylindrical in organization, with traditional work environments stacked at the perimeter, amenities at the building core, and social/collaborative spaces serving as the glue between the two. New amenities, now organized at the building core, are enablers of creativity. Black box performance spaces, maker spaces, holistic wellness facilities, and artist studios provide freedom to undertake the mental and physical exercise of becoming more focused, inspired and purposeful at work. 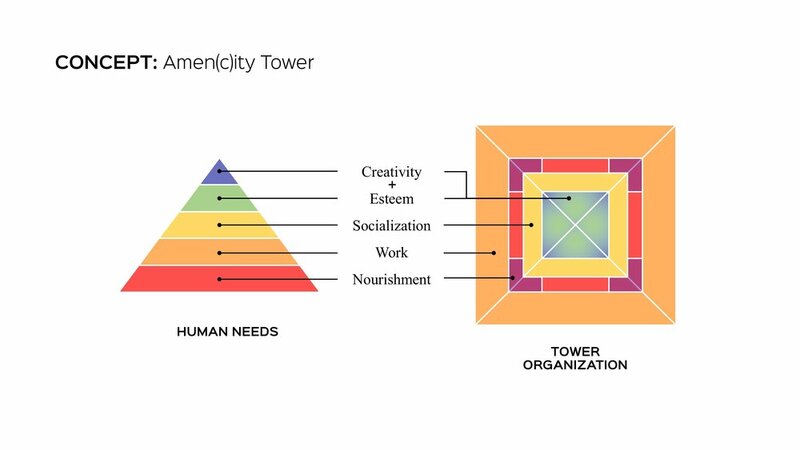 This tower scheme is based upon a premise that workplace amenities should occupy a higher proportion of leasable area – understanding that “work” doesn’t just happen at a desk. The design also requires a shift from traditional leasing strategies in which tenants lease a finite amount of space with limited access to amenities. In this model, tenants instead have access to the full range of amenities afforded by the entire vertical campus under the assumption that providing expanded access will have a positive effect on the work environment. Read the whole article on the NAOIP Blog here.